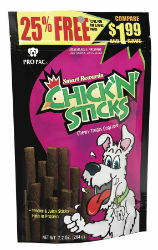 These sticks are chewy, delicious, and packed with the taste of yummy real chicken. Chick'N'Sticks chewy treats are a great training aid or everyday reward for your best buddy! Feed as a treat to supplement your dog’s regular maintenance diet. Provide plenty of clean, fresh water daily for your dog. Chicken Meal, Wheat Flour, Soy Flour, Corn Flour, Sugar, Chicken Fat (preserved with mixed Tocopherols), Natural Chicken Flavor, Propylene Glycol, Liquid Smoke, Salt, Garlic, BHA (a preservative), Added Color (Caramel, Titanium Dioxide, FD&C Yellow 5).